Food deserts are a weakness in a city infrastructure’s ability to provide poorer residents with access to healthy food options. A lack of access to nutritious food options multiplies the barriers to health and wellbeing that individuals who live in multidimensional poverty face daily. For many living in food deserts, gas stations or convenience stores are the closest options for obtaining sustenance. For individuals already experiencing multidimensional poverty, living in a food desert can lead to malnutrition, obesity, or decreased educational and economic achievement. Louisville currently ranks 10th among its peers in households living in a food desert with 3.56% of households living in a food desert. 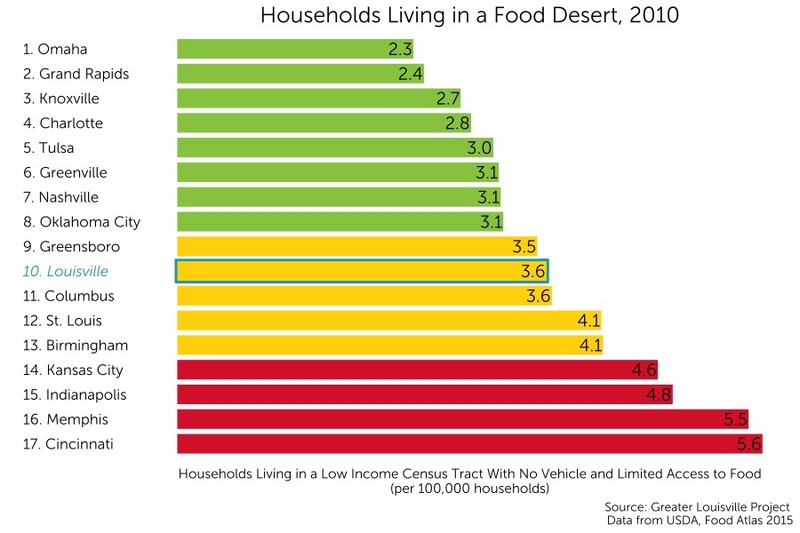 A household is considered in a food desert if the household is in a low-income census tract, does not have a vehicle, and is farther than a half mile away from a supermarket.